Music and cycling go together. Many of us have enjoyed a long solo ride with our favorite music blaring in our ears. A long running practice among cyclists has been that of running headphone cords out a jersey pocket, around your body to tuck under a helmet strap and into an ear. My favorite method is to place one earbud in my ear on the non­traffic side and the other wrapped around my helmet strap for safety. 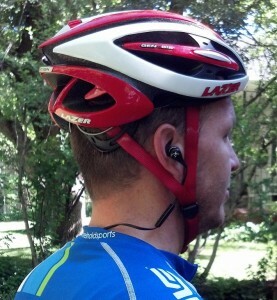 Utah company Jaybird’s headphones make both of these things much easier. My history with Bluetooth headphones and cycling started 6 years ago when I purchased my first pair. It was nice to be unfettered from the cords and go wireless, but the Motorola headphones I was using were the rigid wrap around variety and did not accommodate the “one ear in method” and the signal would cut out when I turned my head a certain way. Plus I looked like Lobot from Star Wars when wearing them. Fast forward 6 year to my first exposure to Jaybird Sports at the Tour of Utah. Jaybird was the official headphone sponsor of the 2012 race and had a booth at the expo. I was amazed by their product as it was light years ahead of the many other iterations of Bluetooth headphones I had tried in the past. This Utah company focuses solely on creating the best Bluetooth headphone experience for athletes. I was provided a pair of the flagship Blue Buds X for testing (full disclosure; they were free and I got to keep them) The headphones included an in­line mic, up/down volume buttons that double as fw/rv for music tracks, and a multifunction button for pause, answering calls, pairing, power on/off etc. The form factor is sleek, with a thin, flexible cable connecting the two earbuds. One of the most noticeable features of these headphones are the ear cushions. Provided in three sizes for different ear shapes, along with three different sized ear bud tips. The ear cushion fits into the curvature of the ear to provide a secure fit that won’t fall out even while mountain biking over rough trails, running, or doing cross fit etc. See the picture for an idea of how this works. Another nice feature is the sealed, sweat proof design. I have a friend who accidentally ran his through the washing machine and though not advisable, they still work beautifully. The science of Bluetooth has progressed tremendously as well. The older versions required a line-of-sight connection between the device and the headphones. The new Bluetooth+ technology found in the Blue Buds X do not require line-of-site but will transmit directly through objects like your body. The connection stays solid and works flawlessly with my phone in a jersey pocket. In fact the connection stays true up to 30 feet from the paired music device or phone. Overall, I was very pleased with this product and the fact that Jaybird continues to innovate and has a number of new products and improvement on the way to market. To learn more visit www.jaybirdgear.com or to see and listen to them visit Bountiful Bicycle in Bountiful or Kaysville or see the website for a list of additional resellers.